Basal cell carcinoma is the most common type of skin cancer, and it is responsible for more than 75% of all skin cancer diagnoses. This is a slower growing cancer that rarely spreads to any other organs or parts of the body. It can be hard to tell where this cancer spot’s borders begin and end, so it can be difficult to remove it all at once. What are the Different Types of Basal Cell Carcinoma? There are three types of basal cell carcinoma, and each one varies slightly on how they act and the areas you commonly find them in. Infiltrating. This type of basal cell carcinoma is usually larger in appearance than you can see with your naked eye. Because of this fact, they are typically not found until they are significantly advanced, and this makes total removal difficult. It is not uncommon to see this type of cancer reoccur after treatment. Nodular. 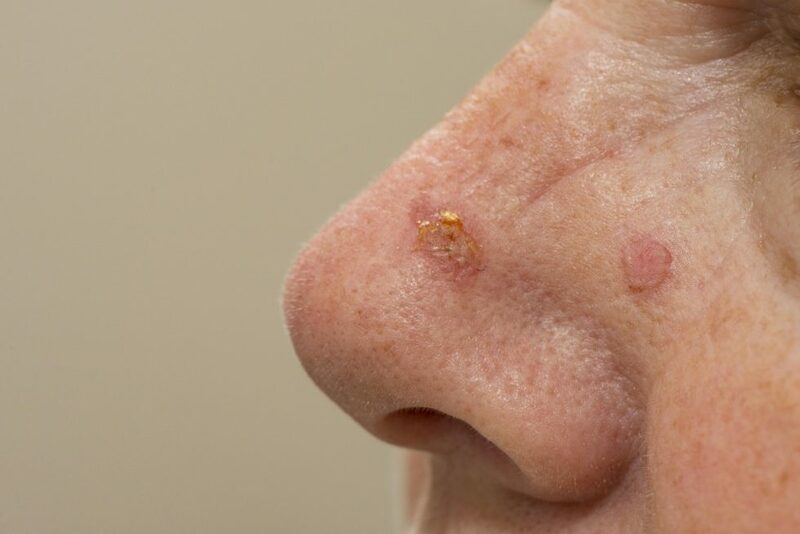 This variation of basal cell carcinoma traditionally appears as a rounded bump or lump under a person’s skin. This type of skin cancer is usually very self-contained, and you don’t typically see the extensions into the other layers of the skin as you do with the other two types of basal cell carcinoma. Superficial. Superficial basal cell carcinoma is a skin cancer that stays in the top layers of a person’s skin. This fact makes them easier to treat with non-surgical options. This type is known to become large if a person goes without treatment. Curettage and Cautery. We will scrape the skin cancer off and cauterize the area to stop the bleeding. There are creams available that you can get with a script from your doctor. Once you apply them for a length of time, they will remove any dead and affected cells from the top layers of your skin. In this treatment, we will apply a liquid nitrogen treatment to the skin cancer and freeze it, destroying the skin cancer cells. This is the most common treatment recommendation, and we remove the trouble spot after we inject a local anaesthetic. As soon as removal is complete, we close the excision with stitches. MOH’s Surgery. This treatment involves removing the cancer piece by piece in a day hospital. As we remove each piece, we check it until we can’t find any more affected cells. If you’re concerned about an odd spot or if you want to see about getting a skin check in a clinic, contact My Skin Centre at one of our nine convenient locations. Our friendly and knowledgeable staff will be more than willing to address any of your questions or concerns. We will also be happy set up an appointment to address any questions and look at any concerning spots on your skin.